Is that no.5 or 6? Another grander takes to the air for the crew of Viking 11. Report: "The first marlin I caught was over 850lb!" AFTER 26 years as master of Viking and Viking II during the Cairns black marlin season, I have never had a run of big fish like I have had so far this season. In the 25 days we have fished, we have caught 10 fish over 800lb, and I believe six of those were over 1000lb ... and pushing 1100lb. Now some of you may think that my years are starting to play with my judgement or I may need to go see Specsavers, but my seasoned crew are also amazed at the results we have achieved so far this season. Day 2 and the action didn't start until 2pm when a classic big fish bite took place on the left tuna bait that had us all screaming, as Paul settled in to a 30 minute battle, which saw him release a beauty - "1000lb-plus" was my call. Day 3 and things seemed a little slower and a lost blue marlin whilst trolling lures out wide travelling north to the bait grounds, did not faze me. We caught bait and started some serious bait trolling, and just as I was about to call it a day and wind in, another big girl climbed on the left bait. This fish made explosive runs, as the line cracked off the reel, then at the end of her last big run she did some amazing jumps before Matt settled into a conventional fight which I deal with on a regular basis. 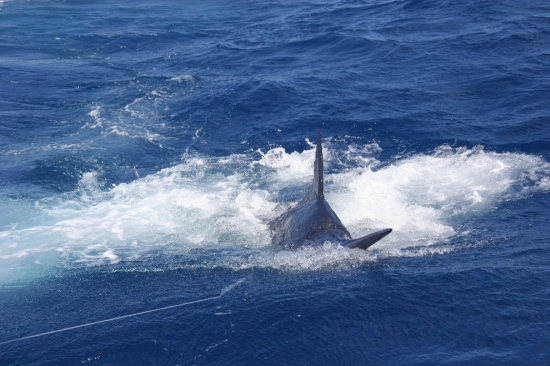 After a short time this big girl was tamed and released - a second 1000lb fish for the three-day charter! Paul and Matt were blown away and so was I. Could this run continue? That fish made it six granders for five charters. When we fish Port Stephens NSW in February and March, marlin are common and the number of marlin released far exceeds Cairns, but up here it’s all about size.